The team at the Coherent Hard X-ray beamline at NSLS-II includes (from left to right): designer Kelly Roy, beamline scientist Lutz Wiegart, contractor and CEO of Huber Diffractionstechnik Norman Huber, beamline technician Joe Sullivan, group leader Andrei Fluerasu, lead engineer Mary Carlucci-Dayton, and controls engineer Daron Chabot. "Phew!" Andrei Fluerasu breathes a sigh of relief as he looks over the plans for the beamline he has been building with a team of scientists, engineers and technicians at the National Synchrotron Light Source II (NSLS-II) the newest large-scale scientific tool nearing completion at the U.S. Department of Energy's Brookhaven National Laboratory. Fluerasu is the group leader for the Coherent Hard X-Ray (CHX) beamline, which will serve as a high-speed "camera" for exploring atom-scale details of materials, biological samples and more, and has been years in the making. "It feels like having a baby, but one that takes a very, very long time." "It's exciting that it's becoming more real," he said. "Seeing things transition from paper to the experimental floor makes me look forward to the science we're going to be doing very soon here." The CHX beamline will be one of seven slated to do early science at NSLS-II when it comes online in 2015. For staff and visiting scientists, it will be a tool to do a wide range of science, such as studying materials for energy storage, or imaging biological samples to understand drug delivery processes. Fluerasu's colleague, Lutz Wiegart, is responsible for developing the endstation instrumentation at CHX and its technical implementation in preparation for the start of the scientific research program, and they both smile wearily as they excitedly discuss what's coming in the next few months for their project. The beamline optics are currently on the open seas, being shipped in from Germany. One component, an ultra-high stability mirror with ultra-high flatness, will be positioned to deflect the light beam that originates from electrons zipping around the NSLS-II storage ring and cut out higher energy x-rays. The mirror will be joined by beam diagnostics, safety components, slits and collimators that narrow the beam. All these pieces, together with two ultra-high stability monochromators that select specific wavelengths of light, expected to be delivered in a couple of months, will produce a beam of photons 10 times more coherent than what is available today at other leading synchrotron light sources. When assembled, the beamline will act like a high-speed camera with an extremely fast shutter, capable of taking "nanoscale movies" of motion within materials or biological samples. "When you have a camera with a fast shutter, you need a lot of light to take good pictures. We definitely have that at NSLS-II," Fluerasu said. NSLS-II will be the one of the brightest light sources in the world with x-rays a billion times brighter than those at a doctor's office. To ensure that the beamline produces clear images, the optics will be affixed to three stabilizing granite blocks, the largest of which weighs five tons. "With the stability we've built in, we'll be able to measure diffusive motions in complex systems such as biomembranes, which are important in the signaling and transport that happens within cells," said Wiegart. Seeing the infinitesimal structures of materials requires x-rays exiting a sample at large angles, while measuring the dynamics of a material how matter moves within a sample on the mesoscale – requires detection of x-rays scattered by a small angle. The combination of a high stability multi-circle diffractometer and a 15-meter long small-angle x-ray scattering (SAXS) table at CHX will allow for both of these types of measurements to be performed on the same sample at the same beamline. Doing both with the same setup reduces error and provides "purer data," Wiegart said. 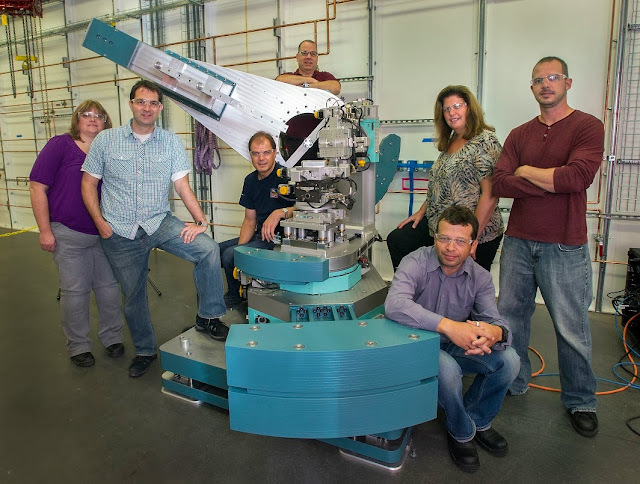 "We've been planning, designing and building this beamline for so long. Getting to use it for full-time science should be really exciting," he added. "This beamline is a tool that will help us study phenomena on very small scales and to better understand the interplay between nanoscale structure, mesoscale dynamics and and macroscopic properties of materials.